You are here: Home / News / The NFL should blame itself for its national anthem “headache”. The NFL should blame itself for its national anthem “headache”. 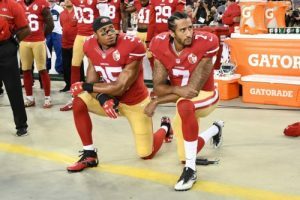 (ThyBlackMan.com) Former San Francisco 49ers safety Eric Reid has continued his collusion case against the NFL. The latest development has been that the NFL Players Association filing a non-injury grievance and a system arbitrator case on behalf of free-agent safety Eric Reid. Reid remains without an NFL team despite his playing skill and possibly due to being the biggest tie to Colin Kaepernick among active NFL players. Kaepernick himself has a collusion case against the NFL as he attempts to display that his demonstrations during the national anthem back in 2016 has led to his unemployment by all 32 NFL franchises. NFL commissioner Roger Goodell was even deposed in Colin Kaepernick collusion case. These collusion cases and confidential meetings based on NFL protests during the playing of the national anthem so how big of an issue that the national anthem remains for the National Football League. The league itself and not the NFL players are to blame for the “issue” being as big has it has become. There are several reasons why the NFL is to blame for its national anthem “problem”. One important thing to remember is that NFL players haven’t been on the sidelines for years during the playing of the national anthem throughout NFL history. Prior to 2009, NFL players being on the field for the national anthem was not the standard that NFL fans are well aware of now. Sports fans should never forget about the NFL’s link to militarism and the “paid patriotism” that has been part of the league’s recent history. Between 2011 to 2014, the United States Department of Defense paid the National Football League more than $5 million in taxpayer money to “honor” U.S. soldiers and veterans at games. Those displays acted as a recruitment tool for the National Guard. It would seem that having players on the sideline during the national anthem plays a part in the significant “patriotism” marketing that the NFL takes a part in. Because the NFL players require NFL players take part in this “patriotism” would inevitably have led to a player doing something like Colin Kaepernick did in 2016 when he originally sat during the national anthem. The NFL also made a critical mistake its official rules as there are no specific directives for what NFL players should do during the national anthem. In the NBA, there is no national anthem demonstrations, sitting, or kneeling by its players because it is required in the NBA’s official rules that require NBA players to stand and line up in a dignified posture along the sidelines or on the foul line while the national anthem is being played. Long before Colin Kaepernick, former NBA player Mahmoud Abdul-Rauf was suspended by the NBA for refusing to stand for the national anthem, which ended up costing Abdul-Rauf money and playing time. However, Colin Kaepernick could not be punished by the NFL or the 49ers for his actions during the national anthem because he did not do anything against its rules in 2016. Ironically, Kaepernick sat down during the national anthem for a couple preseason games in 2016 without significant media attention before his actions made national news. We are past the point of no return regarding NFL players protesting during the national anthem. The NFL can try to create a rule to “make” NFL players stand for the national anthem but trying to force these grown men to do something regarding this issue is a bad idea. Ultimately, the NFL may have to decide between two difficult decisions regarding this issue. They can continue to allow NFL players to individually protest as they please or they institute a rule along with the NFL players union that would end bringing all NFL players on the sideline while the national anthem is played so that there will be no opportunity for demonstrations during the national anthem. Those are likely the two best options. I noticed, that the link to the solution did not work. There is a third option you have not considered! And this option benefits the players, the NFL, and the African American community as well as the nation. To resolve this issue, you have to address why NFL players took a knee, in the first place, and why the African American community is in an uproar. To this writer and to every one else; the National Anthem issue is resolvable, as I stated previously! Trayvon Martin was a youngster; he had just turned 17 years old just two weeks earlier, in his own neighborhood having come from the store with a bottle of tea and candy. Yet, Zimmerman was found not guilty for taking that unarmed youngster’s life. The solution to this problem lies in sending errant officers and proxies of the state to prison for these killings, in an attempt to correct the poor hiring decisions made by police departments personnel offices, who select people who are not well suited for that occupation. See the outlined solution of how to accomplish that, @ http://thyblackman.com/…/the-anthem-a-great…/ The shooting of unarmed blacks can be reduced drastically or resolved just like the lynchings of African Americans were resolved through successfully prosecuting the perpetrators. If you seriously want to help bring a solution to this issue, Tweet the NFLPA @ https://twitter.com/NFLPA by the hundreds and ask them why they have yet to use the money owners have given them (100 million dollars) to sponsor a meeting of stakeholders, suggested by the article. Editing and proofreading are skills that are fading in the United States of America. So?….Sew?….Show?….Sow?…..you reap what you sow? Thy needs to check yo-self.